What's old is new again!!! 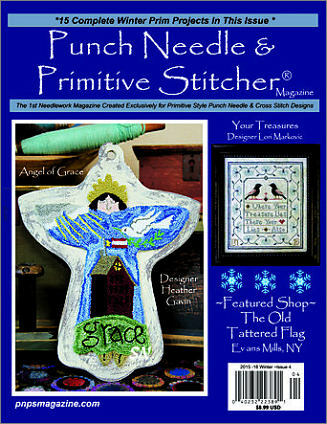 Dating back to the 17th Century, Punch Needle has been around forever, it seems! It is simply a method of punching fabric and leaving a loop of thread on the 'backside' which, when you're finished, becomes the front of your creation! It is JUST THE MOST FUN to do! 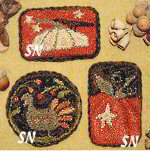 Each of the designs featured below are punched with the Igolochkoy brand of punch needles. 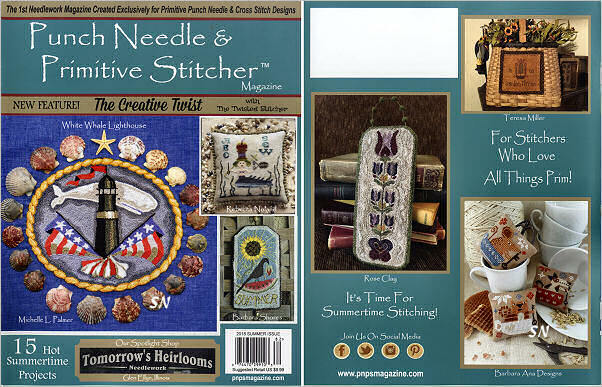 Patterns and needles are available separately, so one set of needles should last you through years and years of patterns!!! There is a little technique involved in getting 'good loops', that sort of thing... and you actually do this stitching from the backside! The punch needle package has a some good diagrams inside to help... including a Trouble Shooting column! Some come with the design already printed onto your weaver's cloth base fabric... others don't. I've made sure to tell you that information somewhere on that particular designer's page, or in the specific pattern words. If you are a beginner, or simply a puncher that wants to DIVE RIGHT IN the minute you open your package... look for the designs that come pre-printed! Tracing isn't hard... it's just sometimes a frustrating and unexpected surprise! 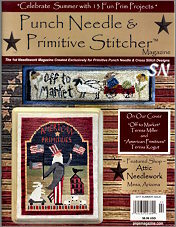 This is a new magazine that is just NEAT! 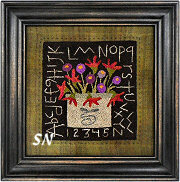 Just like its name implies, it is full of Punch Needle Embroidery and Primitive Cross Stitch. 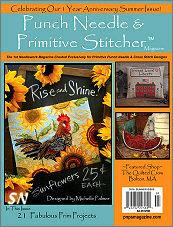 64 Pages of gorgeous photographs, full-sized templates and patterns, in-depth instructions, and fun articles about stitching groups and designers, you will enjoy every single page!!! Printed on heavy paper, each project has its own 2 pages of space... there are no 'noisy' ads interrupting your browsing... and the pictures are just dreamy!!! 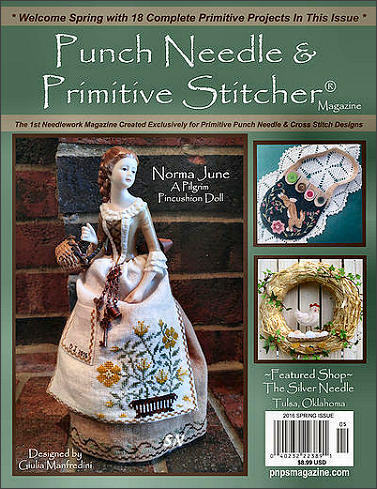 You can peruse the subscription info inside -- I think it's something that needs to be in your mailbox 5 times a year -- each quarter and Christmas time!!! 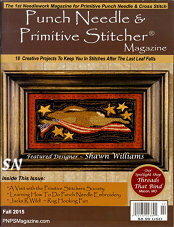 A beautifully sophisticated selection of county primitives, by artist Shawn Williams, these are worth a second look... and definitely deserve your needle's attention! Offered as the design stamped onto the weavers cloth... each is punched in both Weeks and Gentle Art overdyeds. 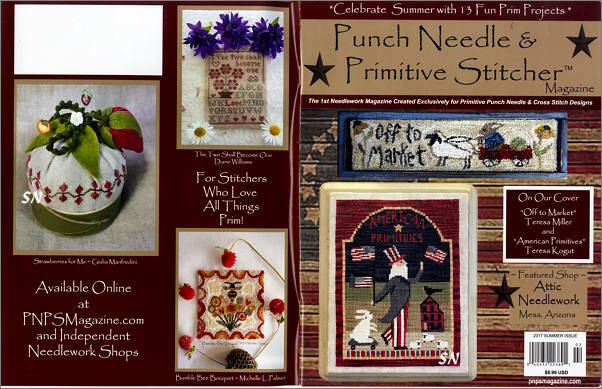 Threads That Bind is undoubtedly the best Punch Needle designer out there... her stuff has such great color sense, none of it is too 'busy' or 'sloppy.' She uses good old fashioned DMC flosses in her designs -- so yours WILL turn out looking as good as the original, (you can actually find the thread at a shop!) and her designs all come clearly pre-stamped on HUGE pieces of antiqued Weaver's cloth. (Huge means like a 14 x 16 piece... so you can get it into a nice large hoop or stand.) Of all our shop models... hers are the ones that always draw the comments and inquiries! We've had this one in the shop -- but it never made it to the website! This punches approx 5 x 5 and is full of yummy Weeks Dye Work's colors of Bright Leaf, Collards, Scuppermong, Terra Cotta, Hazelnut and Rust. Be sure to check out the rest! 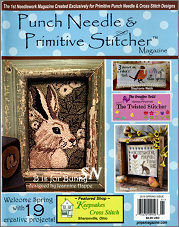 One of Lizzie Kate's nicest Punch Needle designs is shown here... just darling! Joining the Tall Pumpkin as new... Linda has such a way with bright, happy color! 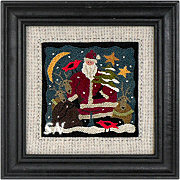 Offered as the design stamped onto weaver's cloth, Santa measures approx 4 x 4, and features a cut-sculpted hat trim. Easy to punch, really vibrant colors. He's watching the pumpkins... crows circling overhead... the early Autumn sky promising a star-filled evening sky... all is well in the field! This piece is really an eye-catcher! Offered as one of Country Threads newest Punch Needle Patterns, it finishes approx 5 x 6, and is punched with a 3-strand needle. Done in DMC flosses, this is one that our Antiquing Finish Spray would be good with -- to add just a subtle undertone of 'dirt' and 'age!' Such great colors, that Harvest Moon behind him is just the best! Offered as the design stamped onto weavers cloth, with at least 4 extra inches all around for your frame, if you use one, ... you add those flosses. This is one of a charming collection of primitive designs that have a bit of elegance in them, to me! 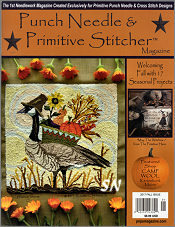 All in the neighborhood of the 4 to 5-inch finished size, each pattern is offered already stamped onto the weavers cloth. 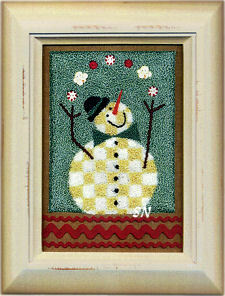 Pretty, soft and dusty colors, they are miniature works of punched art! Wow... this imaginative piece is a show-stopper!!! Offered as a punch needle project, this charming piece could be a tiny rug that's framed for your lake house, a sun porch, or any place you want a reminder of the sea! 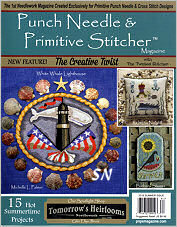 Offered as the pattern presented as a re-useable iron-on transfer, Seaside is punched in a variety of DMC flosses, an overdyed and metallics, features a few clay button embellishments, and finishes a robust 7 inches in diameter. Like looking through a ship's portal window, the colors in this are just wonderful, the design is so unique, the shapes to flowing... can you tell that I just love it?? As a BONUS... EM has included a smaller transfer and complete instructions to stitch this in tiny French and Colonial knots! You'll remember the Teresa Layman miniatures??? This is a seaside version that is knotted on a piece of cotton fabric -- which has a slight mottling to the pattern. A summer companion to EM's Autumn Roundabout and Spring Roundabout... this is a definite!!! Check out the other PN patterns Linda offers, too! This collection of designs just enchants me! Soft country-inspired denims, pastels, and dusky primitives, each is punched using Weeks and Gentle Art overdyeds, and several feature hand-dyed wools as backgrounds to the base fabric. Check out the miniature ornament pattern, and the little penny rugs! 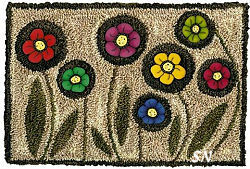 You can punch the rug 'flaps' or make them out of wool... whichever... all of these have such a wonderful, gentle, peaceful and elegant feel! 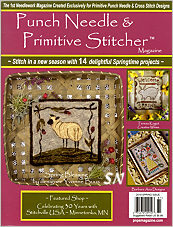 All are offered as the pattern stamped onto Weavers Cloth, and several include some of the wool applique patterns, as well! 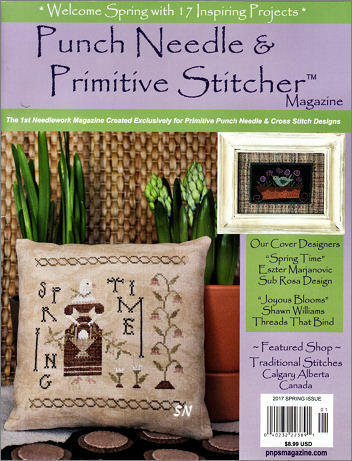 Meme's Cottage Collection represents a medley of Punch Needle artists... all with a flair for color, contemporary lines, and whimsey. Each is presented as the pattern stamped onto base weaver's cloth, along with a stitch guide to create your miniature masterpiece! Bright colors, fun themes, this is a great collection!!! Punch a colorful winter snowman! Offered as line drawings, you'll need to transfer them onto your weavers cloth to punch. Flosses are good 'ole DMC, making these slightly more affordable to punch than lots of other designs, and each is embellished with a few Just Another Button Company clay pieces. Very bright and cheerful, Juggling finishes approx 4 x 5, while Peppermint punches approx 4 x 4. So Cute! DARLING, this comes as a line drawing you will need to trace on your fabric. It INCLUDES THE BUTTON SET of 7 playful posy clay buttons by Just Another Button Company!!! Finishes approx 4 x 6. Super-easy on the punching because there are so few color changes. 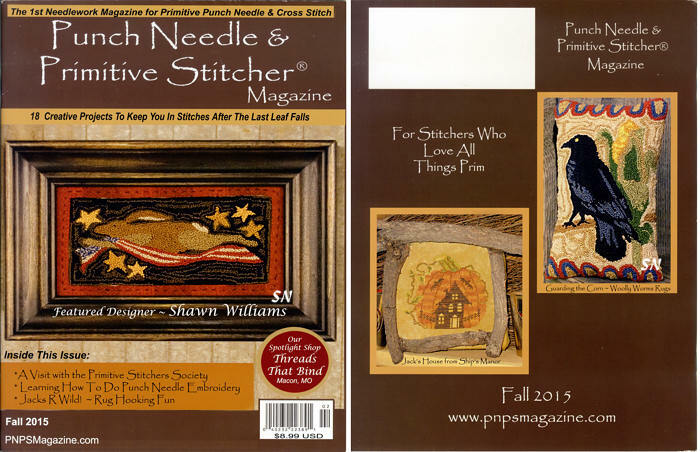 The world of Punch Needle Embroidery was rocked a couple of weeks ago when the blue Ultra Punch Needles (the old Cameo Needles) ceased production and availability. The original company has been purchased this week... with the promise of Ultra Punch Needles again in the future. 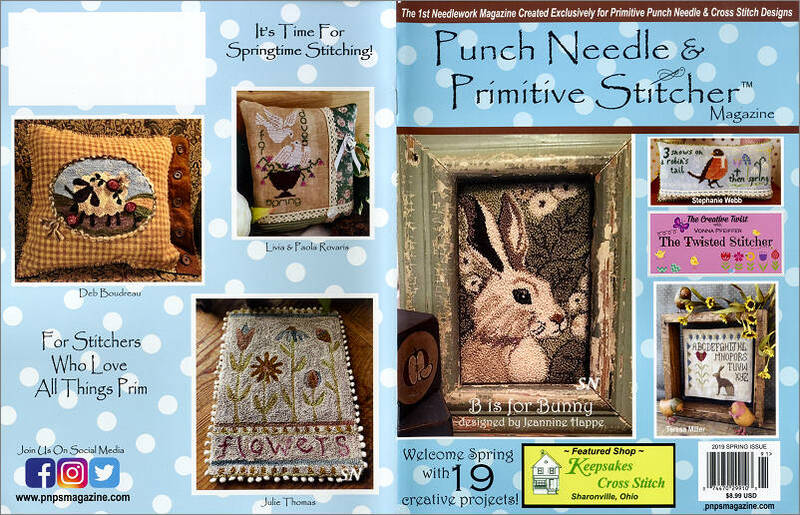 Until then... the *Step Child* Purrfect Punch Needles are here to save the day! There remains great debate (the same as among siblings!) as to which needle is better... YOU (as the parent) get to decide. Purrfect has been around forever... we hope Ultra comes back... but you never know. 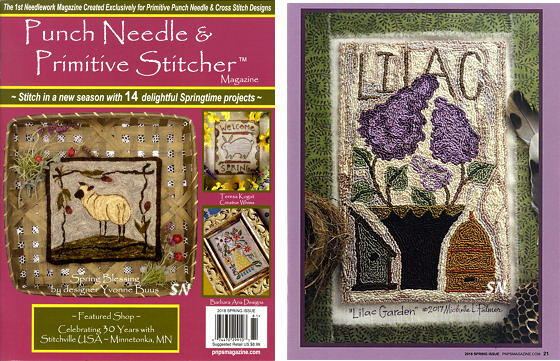 Our Purrfect Needle sets include one needle of each size - 1, 3 and 6 strand - along with two threaders and instructions. 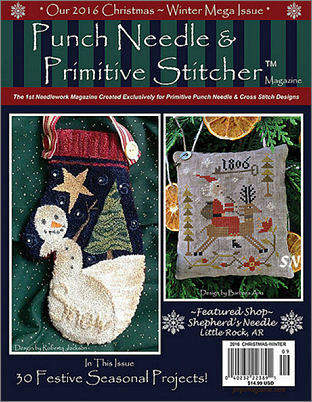 Available as a set of three needles, 1-Strand, 3-Strand and a 6-Strand size... each set includes Russian Punch Needle technique instructions and trouble-shooting tips. 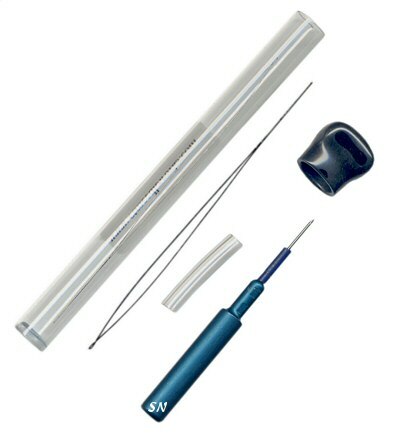 Included in the set are the three various sized needles, each in a clear plastic tube. There are threaders for each needle, along with two extra, and plenty of extra plastic gauges for the individual needles. Each needle includes a guide for thread weights that will work in it -- metallics, silks, cords, so many things I'd never thought you could use! 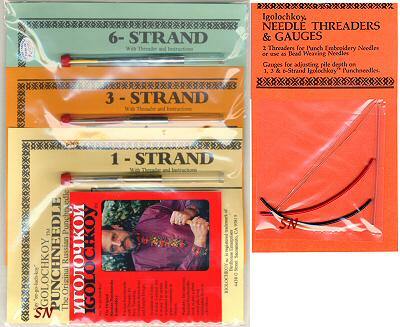 One set of needles should last you for all your punch needle needs... (unless you drop one on its point on a concrete floor!!!) Very heavy-duty, they feel great in your hand. Click the image at right to see the whole set. 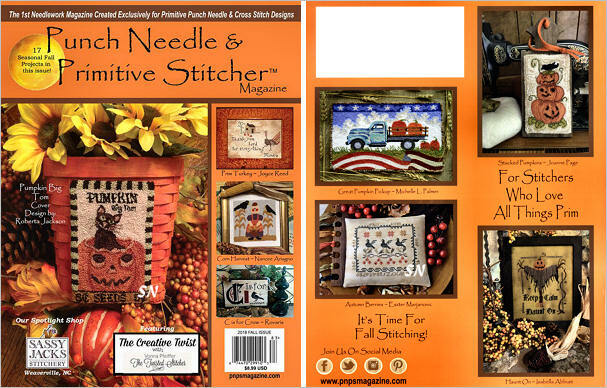 These wonderful needles for Punch Needle Embroidery are now available individually, as well as in the master set of all three sizes! 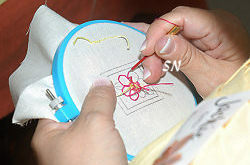 Most designs require the 3-strand needle, the 1-strand being the second most popular size. The individual packages contain the same general stitching instructions as the master set, as well as two threaders, extra plastic loop gauges, and the plastic storage tube. 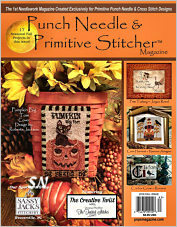 New Russian Punch Needle Needles!!! 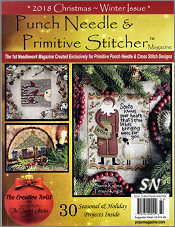 Finally, punch needles that are available individually -- these are WONDERFUL to use!!! Manufactured by CTR these have several great features. After punching with them, I can really recommend them easily, and with lots of excitement! Aluminum shafts, each needle size is color coded, so you can tell your needles apart with just a glance. The beveled edge that seems to be so hard to keep track of is accented by a shaved-out area on the needle shaft -- a permanent guide to determine where the bevel is! The needles all come with pre-cut gauges that are all uniform in size to each other, and the handles of the needles are thicker than we're used to, a little longer, and SO much easier to hold! There are general Punch Needle Embroidery instructions included with each needle, as well as trouble shooting tips. Three line drawing freebie designs by Charlotte Dudney, and Charlotte's Designs from the Pep'r Pot... and wonderful diagrams for proper threading are tucked in with each needle as well! Packaged in a clear plastic tube, a threader is included with each. Really, really nice... you'll enjoy these!!! What a cool tool for us Punchers!!! Brand new to the Needle Punch crowd, this is a double set of extra-heavy duty hoops that fit together with little legs... to offer a raised area for you to punch in. Designed to sit in your lap... put your project in the 7-inch hoop, or turn it over and use the 10-inch hoop. Then, if you want, stretch a piece of fabric in the hoop not being used -- the one on your lap -- and it becomes your little tray-table for your materials and tools! Excellent stability, super heavy-duty, there is a hidden notch in the hoops that 'lock' the fabric in place perfectly. 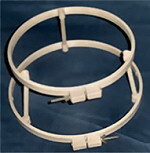 The larger sized hoops give you the flexibility to punch larger projects, as well! 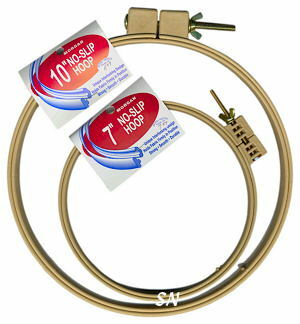 And... each hoop can be used alone, if you don't want the double feature! Offered in two sized combos. No more stabbing your knee (!) 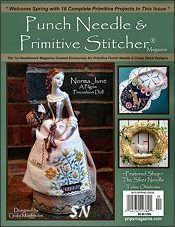 with the punchneedles, or cramping your hand holding a flimsy hoop! 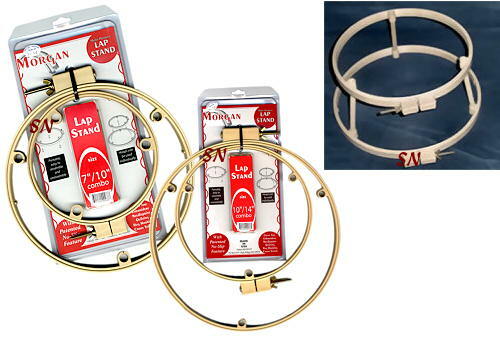 UPDATE: The Morgan Hoop Company has two new size combinations! Designed to give you many more options with hoop sizes, each is still the idea of two hoops attaching together with little legs in between to make a lap frame. The same great quality as the hoops in the Morgan Stands... these are the individual hoops! Super-extra-sturdy, although they aren't pretty like our softer, brightly colored hoops... these are far superior for tension, and MUCH more substantial in feel. These won't 'bend' if your fabric is super tight...(they kind of feel like you could run over them with your car, and not crush them!!!!! but... I'm not trying it!) More money... more Hoop for the money!